Buffy Comforter Review - Warm And Eco-Friendly? 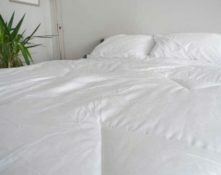 Home » Buffy Comforter Review – Warm And Eco-Friendly? The Buffy is a down alternative comforter that just recently hit the market. In a short amount of time, this comforter has become very popular, and I was very excited to try it out. Personally, I was interested in its eco-friendly components and temperature-regulating properties. Is the Buffy a green option that will keep your body at the perfect temperature? Read on for my full review. 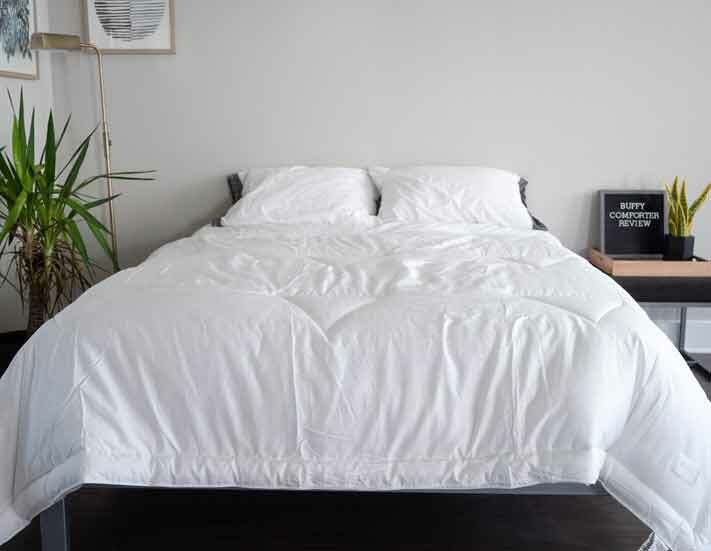 The Buffy is an eco-friendly comforter that features technology to fight overheating. You are looking for a green product. If you want a piece of bedding that is made with consideration for the environment, the Buffy comforter could be a good choice for you. The cover contains eucalyptus that is responsibly sourced, and the fill is made from recycled plastic bottles. You struggle with allergies. While down is naturally fluffy, it can also trap allergens and dust mites. Some allergic sleepers complain of watery eyes or a runny nose when they use a down comforter. If this is the case with you, the Buffy should be a good option. The recycled fill is hypoallergenic, so it shouldn’t trap those allergens. You want a comforter for fall or winter. The Buffy comforter is on the thinner side, but it had no problems keeping me warm on colder nights. (Granted, I live in Austin, where it never gets terribly cold.) I felt great insulation, and it was decently breathable. If you want something light to warm you during the colder months, the Buffy should work for you. You want a lofty comforter. If you like your comforter to give you the feeling that you are sleeping under a cloud, the Buffy might not be the best match for you. It is a thinner comforter overall, and while it does keep me warm, it doesn’t have that fluffy loft you get with a down comforter. You are a hot sleeper. If you often overheat at night, the Buffy might not work for you. It features 37.5 technology and a breathable cover, which are both meant to regulate temperature. However, in my experience, the Buffy felt somewhat stuffy when it was warmer in my bedroom. I did have to move out from beneath the comforter because I was getting too hot. I am a naturally hot sleeper, so if you are like me, you might overheat under the Buffy. You want a value down alternative comforter. One of the upsides of down alternative comforters is their relatively lower price compared to down. The Buffy is currently priced at $150 for a Queen size, which may or may not seem affordable to you. The Buffy does come with some interesting features, namely the 37.5 temperature regulating technology. However, if you want a more affordable down comforter, I would look elsewhere. The outer shell is made of 100 percent eucalyptus fabric with a 300 thread count. The fill is a hypoallergenic down alternative made from recycled plastic bottles. The shell fabric and fill contain 37.5 technology. They are active particles designed to regulate your body temperature and keep you from getting too cold or hot. The comforter features sewn-through triangles to hold part of the fill, while the rest of the fill is more loosely held throughout the rest of the comforter. While lying under the Buffy, I can really feel the eucalyptus in the shell. First off, it feels very soft — softer than many cotton and microfiber comforter shells I have tried. In addition, it is worth noting that eucalyptus has anti-inflammatory properties. I cannot personally attest to this, but theoretically it could help keep your skin smooth. In addition, the eucalyptus in the shell can also help with cooling. The cover also contains the 37.5 particles which can further cool you when you are feeling hot. I will say the comforter is very cool to the touch and feels nice against my skin. I expected the Buffy to be fluffier based on the advertising and product notes. When I took it out of the box, it did seem like it was going to be a very lofty comforter. However, once I unfolded the comforter, shook it out, and placed it on the bed, it appeared quite thin. The Buffy comforter has a very low profile and lies almost flat on the bed. This is a down alternative comforter, and these are rarely as fluffy as a down comforter. If you want a thinner comforter, it could be a good match. If you like a lofty comforter that really rises off the bed, I would look at down comforter. For a thinner comforter, the Buffy is surprisingly warm. On a colder night, the comforter kept me very warm and insulated. I did not need another layer throughout the night. However, when it was warmer outside, I did overheat somewhat. For a down alternative comforter, the Buffy has decent breathability. But considering the eucalyptus fabric and 37.5 technology, I thought I would sleep cooler on warmer nights. Again, I will note that I sleep hot, so it is possible many people could find this to be a good fit even on warmer nights. However, most hot sleepers should consider a cooler, more breathable comforter. In addition, they recommend putting your comforter in a duvet cover if you like to clean your comforter often. That way, you can simply take the cover off and wash it at home. In the end, I was impressed by the green, eco-friendly nature of the Buffy comforter. The responsibly sourced eucalyptus and recycled fill made me feel comfortable knowing this was a more environmentally sustainable product. The comforter was also warm and insulating, and I did not need another layer on colder nights. However, I did find the comforter to be thin. I prefer a fluffier comforter, especially when I plan on using it on colder nights. In addition, as a hot sleeper, the Buffy did cause me to overheat somewhat. If you want to try the Buffy, they have a very unique sleep trial available. You can try the Buffy for 30 days for free. If you don’t enjoy the Buffy, you can simply send it back before the 30 days are up.